A lot goes into winning a race. The driver, car, engineers, and pit crew must all work together in perfect harmony to deliver results and performance under pressure. On their own, they cannot win a race, but if any of these elements are missing then the collective unit cannot achieve winning results. It's a similar story with networking. In a world where user demands are skyrocketing, networks are coming under increased strain. 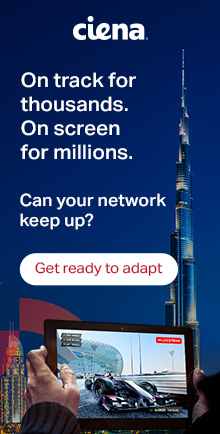 There are a number of critical elements of Ciena's Adaptive Network that combine to enable our clients to deliver richer, more connected experiences for their business and consumer end-users. The following blog explores the crucial role played by Software Control and Automation within Ciena's Adaptive Network, and the opportunities and challenges it addresses. 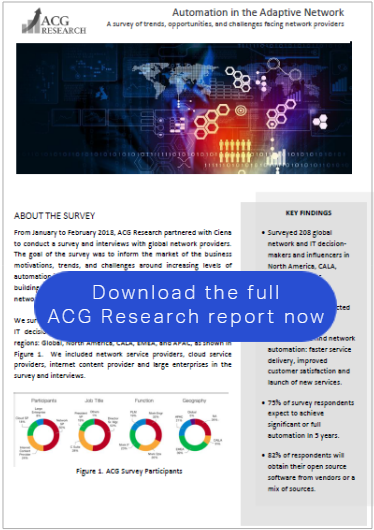 ACG Research partnered with Ciena to collect over 200 surveys and interviews on service provider attitudes, opportunities and challenges related to Software Control and Automation. The results show clear pain points and expectations for the move to greater network automation, as well as a divergence in how far along various types of network operators are in this evolution. Service providers want and need automation to improve service delivery times, help launch new services faster and reduce operational costs. But, for service providers to fully realize their goal of an autonomous network, they need more than just automation. In February 2018, Ciena introduced the Adaptive Network, which outlines their autonomous networking vision and identifies with three key components for success: a Programmable Infrastructure, Software Control and Automation, and Network Analytics and Intelligence. Independently, each of these elements is necessary but also insufficient to fully realizing closed-loop automation for Communication Service Provider (CSP) networks. ACG Research partnered with Ciena on a primary research project to further explore one of the elements of the Adaptive Network: Software Control and Automation. We collected over 200 surveys and conducted in-depth interviews to piece together a mosaic of service providers attitudes, opportunities and challenges related to software control and automation. We included traditional communication service providers, webscale providers (cloud and content) as well as large enterprises. We obtained results from executives in all four geographic regions. We began by exploring the motivations behind the move toward software control and automation. Although the desire to reduce operational and capital costs are certainly present, these motivations are secondary to more customer-centric ones. The top motivations behind increasing automation: faster service delivery, improved customer satisfaction, more rapid launch of new services, and increased agility to enable future adaptations. In interviews, multiple service providers expressed rapid network growth and an excessive amount of manual operations as catalysts for change. Predictive maintenance and automated capacity adjustments were cited as desired automation use cases by multiple interviewees. Every interviewee expressed optimism about the future of software control and automation. Across the board there is a general sense that each service provider has begun its automation journey, that each is somewhere in the middle of reaching the end-goal and a sense that automation is almost inevitable. The question that remains is how best to achieve their objectives. This same optimistic attitude is reflected in the survey results, where 75% of respondents thought their network would be significantly or fully automated in the next 5 years. But that’s not to say that every service provider is at the same level of automation maturity or that no challenges remain. 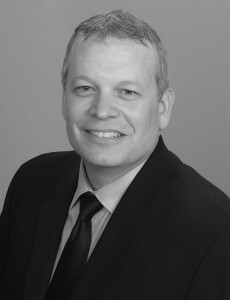 Out of necessity, global cloud service providers and internet content providers appear to have the most mature approaches to automation implementation, with centralized executive sponsorship of projects, clearly enumerated key-performance indicators (KPIs) to measure success, and regular oversight to adjust the plan when needed. For some network service providers and enterprises, the process was far less mature: with siloed and sometimes duplicate trials and implementations in different parts of the company, few if any clear KPIs to measure success other than operational expense reduction, and little regular executive oversight. In these companies there is a sense that the process will mature over time, but as of right now it is more ad hoc and siloed. Although some interviewees expressed frustration with insufficient funding for network software control and automation, the good news is that spending is expected to increase by 30% between now and 2021. Other frustrations include lack of proper software skillset inside the service provider (and in some cases the vendors) and lots of legacy services and applications that make automation difficult. Consistent with the interview responses, skillset limitations or lack of trained personnel was one of the top-four items cited in the survey as limiting automation today. Concerns about security and the need for increased intelligence/analytics were top of mind when we asked about current limitations that are holding back automation today and key components that are needed to increase automation going forward. As one would expect, there is general concern about protecting the network as well as service provider and customer data from theft or attack. Interviewees expressed a hopefulness that automation can help overcome human errors leading to improvements in overall security. However, there was also a general sense that automation can cut both ways. Automation also introduces with it the ability to replicate a small isolated error broadly and rapidly. Service providers are very concerned about getting automated security done well and are actively collaborating with vendors to protect the network and the data. The need for increased intelligence/analytics is right on point with Ciena’s Adaptive Networking vision. In discussions with service providers, the ability to obtain data from their network elements and virtual software functions is improving; they are moving away from polling mechanisms like SNMP and toward streaming telemetry approaches like gRPC. However, a sea of data is useless without the ability to analyze and extract intelligence, or what I call “golden nuggets of information.” To fully realize increased network automation and achieve the other goals/motivations service providers listed as high priorities, we need a system that can extract information for real-time network changes and adaptations. With multiple new superhero movies debuting, including the Avengers: Infinity War and the Black Panther, we concluded our research by asking service providers to select the superhero that best represents their network when arriving at their network automation destination. The top-three superheroes are The Hulk, Spiderman and the Black Widow. Strength, speed, intelligence/smarts and flexibility were all listed as top reasons for selecting a specific superhero. 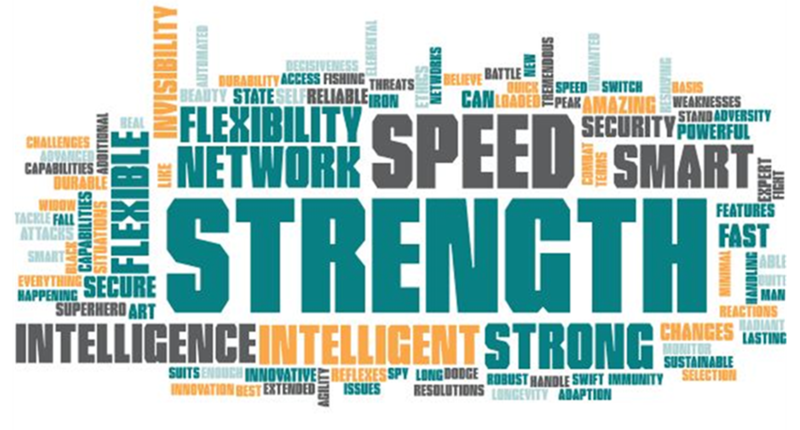 Who wouldn’t want those attributes from their network?